Some things are just so good, you can’t get enough of it, even a few days later. Such is the case with the University of Hawai’i basketball team’s epic Big West Conference Tournament championship game last Saturday. In what is now on the list of most exhilarating and meaningful victories in program history, the Warriors beat Long Beach State, 64-60, in the title game at the Honda Center in Anaheim, Calif. The victory earned the Warriors a spot in the NCAA Tournament for just the fifth time in program history, and the first since 2002. This is also just the fourth conference tournament championship for the Warriors in 37 years of conference affiliation. Hawai’i, which is a No. 13 seed in the South Region, will play No. 4 seed Cal on Friday at the Spokane Veterans Memorial Arena in Spokane, Wash. Friday’s game is scheduled to start at 8:00 a.m. (Hawai’i time), and will be televised nationally on TBS (Oceanic channels 551 and 1551 in Hawai’i). Before looking ahead to the matchup with Cal, the above video is a look back at the unforgettable post-game celebration that took place on the Honda Center court. • Senior starting guard Quincy Smith sat out the second half of the semifinal game on Friday night with a hip injury. His status was officially in question up until game time. Behind closed doors, Smith wasn’t going to let anyone – or the hip injury – prevent him from playing in the championship game. • Sophomore reserve guard Niko Filipovich was thrust into the spotlight when starting point guard Roderick Bobbitt was assessed his second foul of the first half with 12:34 remaining. Filipovich responded with four points, including a momentum-building layup just before the halftime horn sounded. He also defended Long Beach State point guard Justin Bibbins, who is a second-team All-Big West selection. Filipovich and Bibbins were teammates at Bishop Montgomery High School in California. 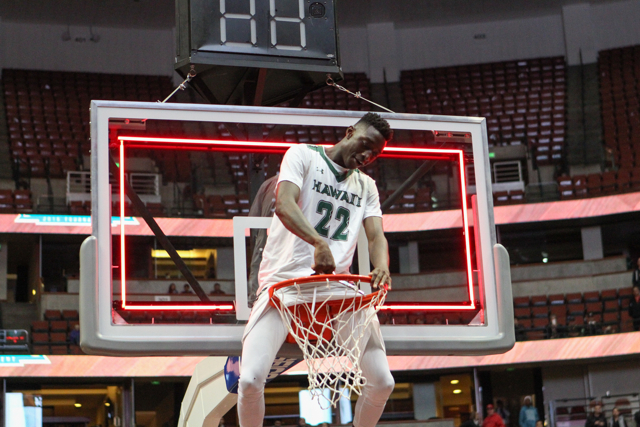 • Freshman guard/forward Sheriff Drammeh scored a season-high six points – on 2-for-2 shooting from 3-point range – while playing 21 crucial reserve minutes in the title game. His play essentially allowed Smith to receive moments of rest throughout the game. • Junior center Stefan Jovanovic had nine points and six rebounds in the championship game, capping a solid three-game tournament for the 6-11 reserve. He finished with 21 points on 8-for-14 shooting (57.1 percent) and grabbed 14 rebounds while providing valuable relief for Big West Player of the Year Stefan Jankovic. • Aaron Valdes scored 51 points on 18-of-29 (62.1 percent) shooting from the field, and added 21 rebounds and 14 assists in the three games of the tournament to earn Most Valuable Player honors. He is the fourth UH player to earn a MVP award for a conference tournament, joining past WAC Tournament MVPs Trevor Ruffin (1994), Carl English (2001) and Predrag Savovic (2002). • Hawai’i men’s basketball teams are now 6-0 when playing as the No. 1 seed in a conference tournament. Prior to this year, the only previous time that UH was a No. 1 seed was during the 2002 WAC Tournament. The Warriors went 3-0 in that tournament, which was played at Tulsa, Oklahoma. • This is only the second time in UH basketball history that both the Hawai’i men’s and women’s teams are participating in the NCAA Tournament in the same season. In 1994, the UH men won the WAC Tournament to earn an automatic bid, while the UH women received an at-large bid. This is the first time that the UH men and women won the conference tournament title in the same season. 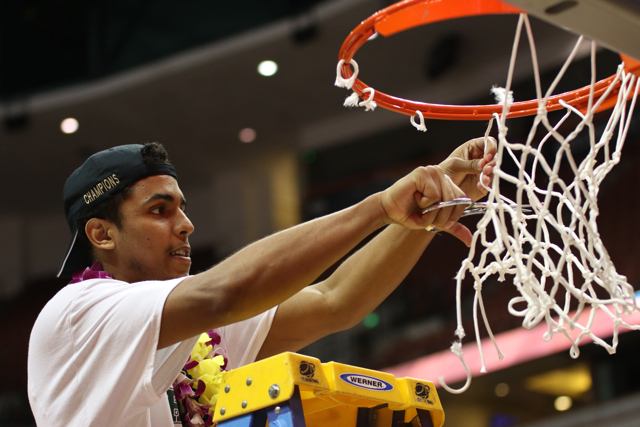 • The victory was Hawai’i’s 27th of this season, tying the school record set by the 2001-02 team. The 27-5 overall record also matches the mark that the 2001-02 team had entering the NCAA Tournament. The NCAA has provided approximately 200 tickets for the University of Hawai`i Athletic Department to sell in sections 105, 106 & 206. Monday, March 14 @ 11:00 a.m. – H-Club Members (National Champion, All-American, All-Conference, Captain). Four (4) ticket limit to be enforced. UH Corporate Partner inquiries, please contact Chandra Kinilau at (808) 956-5289. If our Rainbow Warriors are victorious in the First Round, customers that purchased tickets will automatically be charged and receive tickets for the Second Round game on Sunday, March 20th. Tickets can be picked up on game day at the Hawai`i will call at the Spokane Veteran’s Memorial Arena on game day one hour prior to tip-off. The UH allotment is located in sections 105, 106 & 206 in the Spokane Arena. Its just simply amazing!! So proud and stoked for these guys and the coaches! 1. Their star freshmen are well, freshmen. Jaylen Brown is 9/42 from the field in his last four games– that’s 21%. For the season, He’s 43% from the field, 30% from 3, 65% from the line and he averages 3 fouls and 3 TO’s in only 28 mins/game. This tells me he’s either going to torch us with his elite athleticism, or he’ll be a non-factor because our perimeter defense just might keep him in check. Ivan Rabb is more consistent than Brown. He will give us fits with his rebounding skills and defense. He’s been staying on the floor for 30+ minutes his last few games, so it’s critical to try and contain him and get good shots off. I’ve watched him against Utah a few days ago and his footwork is skilled. I’m really worried about this kid. 2. Cal is one of the worst teams in the country in forcing turnovers. We must take care of the ball and not make that stat relevant. Conversely, Q and Rod are one of the best backcourts in generating steals. If we can fluster Ty Wallace and Jordan Matthews on the perimeter, we will win the TO battle which will hopefully lead to points off turnovers. 3. We’re undefeated when we win the battle of the boards. Cal averages 40/game, we average 37/game. Rabb will be a handful, And Wallace and Brown crash the boards hard– we gotta box out and prevent a Long Beach moment when we gave them offensive boards. Terrific video, thanks Dayton and WarriorInsider. These are memories all UH fans will enjoy for a long, long time. Thanks for talking to Niko about playing against his former teammate. Niko seemed especially active in defending Bibbins. Both being point guards, I’m sure they went after each other a lot in practices. Dayton, great job on the post-game celebration. This video is a keepsake for the team, the fans, the Schmidts and WarriorInsider. Awesome stuff. Indeed, it was just brilliant to get Niko some extraordinary minutes and to have a secret weapon against Bibbins. He had another Niko-defensive moment where he just ripped the ball away from some LB player. Way to go Niko. Good game. Without the slightest doubt HC Ganot is the Prime-mover. But his ability to recruit assistances, really showing. Performance of each player helped each win. Synergy of solidarity takes individual will and technic. Training provided by a perfect STAFF made every player played better! UH, Janks, Stef haven’t faced a mobile tall man like Rabb this year, except for Lattin of OU ? Ok, I just created my ESPN bracket. I got Hawaii playing and beating North Carolina in the championship game 75-73. We defeat Oklahoma in a rematch to get there. Hey man, if you’re gonna BELIEVE, you gotta BELIEVE all the way baby. We’ve already lost our one game in March. JUST WIN!!! GO BOWS!! Rabb, Brown and Bird were all 5 star players coming out of HS and are extremely talented but I’ve watched them all year in the bay area and they are inconsistent. I think that Tyrone Wallace is the most consistent player and they struggled when he was out with an injury earlier in the year. I think it will come down to Cal’s 3pt shooting. If they are shooting well they are hard to stop, but if they are cold then we will definitely have a good shot at beating them. Rooks and Rabb are not huge low post threats but they are active on the glass and can knock down the mid range shot. Thanks for the coverage. Go Bows! I just booked a 3 bedroom home in spokane, so far just my son and I are staying in one bedroom, if anyone (OAKLAND, Mikes mom, etc…I just talked to q and he gonna let his family know, as he says they’re still making plans) needs somewhere to stay. All hotels in spokane are sold out, so people are staying 45 miles away in Coeur d’Alene. This is a good deal, at $80/night for your own bedroom. I’ll check this board later to see if there’s any interest. Leave your contact info (phone or email) if interested and I’ll get back to you later in the evening. To go all the way, you have to win a lot of close games, maybe 2 games by 1 point, maybe 2 by 2 points, maybe in overtime. The ball have to bounce your way and 1, maybe 2 key plays will make the difference. You have to convert from the foul line, make your share of 3s, rebound, and take care of the ball. At this time of the year everybody’s good. Warriors have to play well to stay in the game and have a chance. If not, they will go home. Have to play team ball and try to ride the hot hands. Good luck Coach Ganot, staff, and players, and trainer. Might as well go all the way. Play free and let it fly. It’s the year of the Warriors. Golden State Warriors too. With this 2014 to 2016 great warrior run. From Zach to Sai and team first. To a man . They want to finish as one of top 8. 4. or 2 teams in ncaa dance. You can feel it. The confidence. One family. One goal philosophy is running 100 %.!! Go Bows! Houston the warriors might be landing in 2 weeks! They have the athletes. And defend too well. And can closeout close games with 4 good guards!! .! 30-0 this year. Top 10 and battling for the big one too! Isaac Fotu aloha too.from Warrior nation!! Long Beach State up by two with less than four minutes to go against Washington in NIT on ESPN2 right now! Faust…CHOKE! Lol. I was actually cheering for him…Big West anyway. Oh well, Irvine should have made it anyway. Saw the end of that game, just in time to watch Faust go 0-for-3 from 3 in the closing minutes. He did score 26, but also took 22 shots (he was 4 for 13 from 3). It would have been nice for the conference for Long Beach to advance, but at least they played well … until the final minute or so. Too bad Faust is gone; he could have been the next Chris Herren for UH. Nuff Beach talk. Good to hear that Dayton/WarriorInsider will be in Spokane. Mary’s Gaels.Eran they have Aussie pipeline for next few years? Dane Pineau.6’9″. Cal product. Formet warrior targets. Cali HS star Evan Fitzner. 6’10”. Good fundamental big team the St. Mary’s team against big NMSU team. BigDrink, that’s a great article. Thanks for sharing!!! Getting pumped up for Friday already! Hear that da team will be wearing black uniforms for Friday’s game. Hawaii fans are encouraged to wear black also. UC Riverside and the LBSU women are in the WNIT. Btw, my son and I stopped by the team’s final practice today in fullerton before they boarded their charter flight (yes! The ncaa charters flights for the participants! What a treat for the team) for spokane, and before we hit the road for vegas, then boise, then spokane!! Observations: the team looked very good. Focussed, yet relaxed, and full of energy. Quincy looked good. Not 100%, but definitely on his way to being 100%. He is tough!! Team was already working on scout vs cal’s offense AND defense, as coach John appears to have done a thorough job already of putting together the scout vs his former team. These guys will not lose due to being under-prepared! I even saw a few different wrinkles today that may be a surprise to cal (so much so, that I won’t mention the specifics on this public forum). All in all, it was a great practice. Our boys will be ready!! The temperature is 33 degrees right now in Spokane. Today is Roderick Bobbitt’s 23rd birthday. Savo, Roderick Flemings, Carl English, Dillinger and Rozitis among those congratulating the team and Ganot, per McInnis retweets. 32 degrees is the freezing temp.